There are 17 reviews of Vitriol d'Oeillet. Doesn't anyone else smell the onion? Anyway, on me Vitriol is a rather nice clove/carnation mixed with dusty iris and frankincense. It reminds me of Serge's Encens et Lavande, but with the lavender replaced by carnation. It's a great combination, darkly pretty, evocative and almost "haunted" in its shadowed dustiness. But Serge wouldn't be Serge without a trick up his sleeve, so there's also a wayward mix of cat pee blackcurrant and fennel that combines with the dusty incense to smell like old, drying onion skins. It's an interesting artsy undertone at first, but becomes a full-on stinky onion smell a few hours in which just ruins everything for me. Oh well. I appreciate that Vitriol is trying to do something different, but it's a no for me. The peppers are immediately evident, giving the scent the sharp, pungent aroma of oud. It's very dry. I am assuming the "woods" is the oud. It takes a while for the floral notes of carnation and iris to surface, but they are immediately done in by the strong clove and nutmeg blanket. Since carnation and clove are identical in scent, differing by strength and intensity, the carnation note being light, green, spicy and fresh, and the clove being powerful and dark, there is no contest when you put them side by side. The clove always overpowers the carnation. An interesting experiment gone wrong, in my estimation. The balance is all wrong. None of the delicate notes are allowed to be buoyed up by the denser ones. Instead they are submerged and smothered. One of the oddest scents I have ever experienced and a total failure. A cool, intense violet; hints of powder and blueberry (a cool colored berry). Sweet. Even though it's cool there's a vanilla note in there. Little old lady wearing powder and violet perfume. Very interesting fragrance - there's something that almost itches the nose (the pepper? ), slightly off-putting but unusual and fascinating. Dries down to soft, spicy powder - it warms up a touch but still on the cool side. Long lasting but in about 2 hours fades until only detectable on being very close to the wrist. A mild thumbs up. Nothing problematic here. A light, wispy scent. Rather pleasant, and certainly nothing like the odd name suggests. Indeed, a better name would be "Rose en argent" -- (rose in silver) -- for that is what the scent suggests. The iris and carnation notes blend to create a light rose note. The scent is dry and airy. Peppery spices are subdued but keep things dry. There are light and breezy hints of wood, and an airy note which sometimes suggests mint and other times freshly-cut paper. 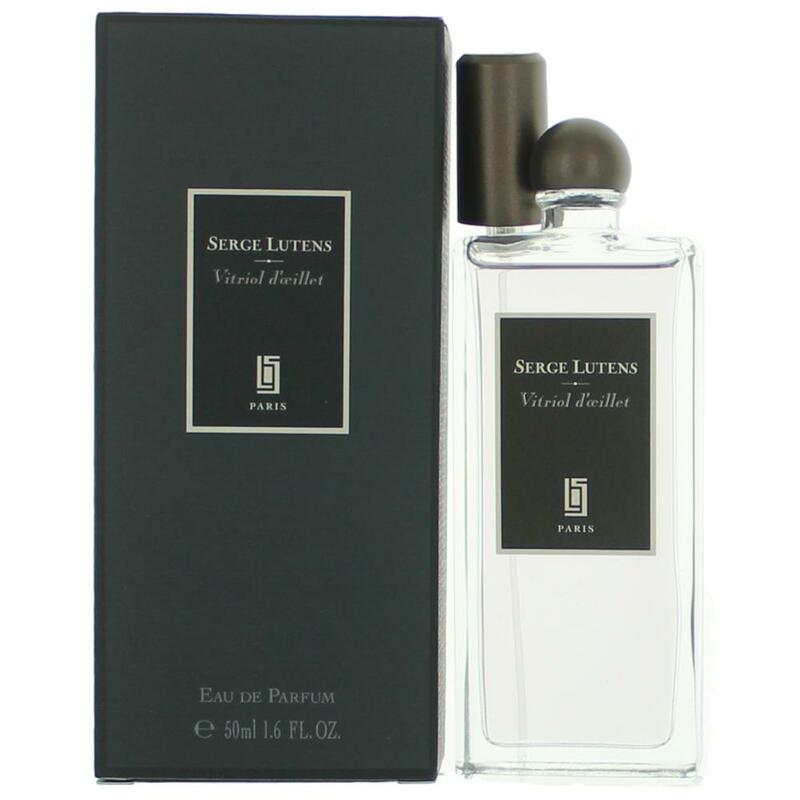 This light style is unusual for traditional Serge Lutens, perhaps part of the nouvelle vague of that house. I have a feeling this one gets overlooked because of the ho-hum reviews and lack of punch, which is understandable. There's nothing "vitrol" about it...it's fairly tame in comparison with other spice-bombs. Also, carnation is tricky...many of us have associations with outdated perfumes, or even soapy-smelling cosmetic products. Alas, Vitriol d'Oeillet is still a beautiful, dry, spiced-floral, relying heavily on ylang and rose to conjure the image of a proper carnation. I happen to find it very wearable and elegant, minimal in its details (a good thing), and a good candidate for any guys out there looking to dip their toes in the land of florals. There are no member images of Vitriol d'Oeillet yet. Why not be the first?